Found a great signal, but a provider's lot is too small? You need larger position volume, but terminal settings are too poor? 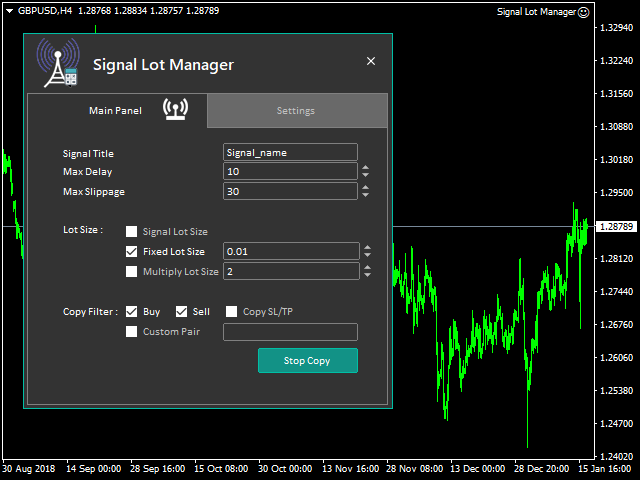 Signal Lot Manager will increase the provider's position volume by means of a duplicate order of the needed volume. Just set a lot size and a name of a signal for copying orders from. 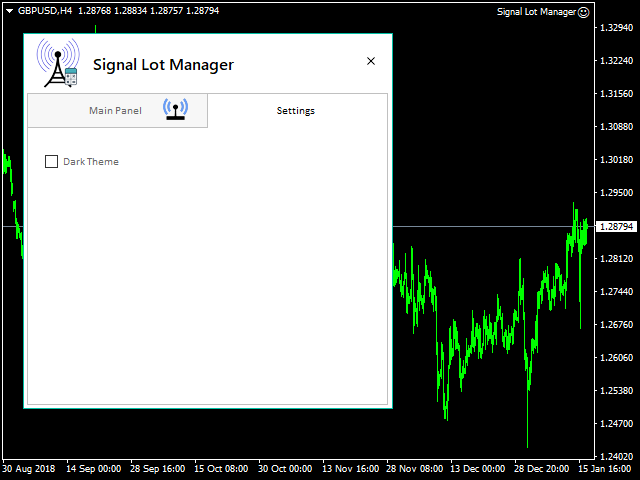 Signal Title : name of the signal (you can copy it form the Signal Order comment). Max. slippage: Maximum accepted slippage to open trades. so if the current price exceed max. slippage distance compared to entry price of signal order, the trade will not be copied. This is useful to prevent unwanted slippage of copied trades, specially during high volatility (news releases). Max. delay: Maximum waiting time that trades can be still copied from signal order. If this trade timeout is exceeded from signal order trade open time, trade will not be opened, This is useful to prevent copying outdated trades if account/terminal is shutdown for a while. For example: Trade timeout is 60 seconds means if terminal is disconnected while signal open a Buy/Sell order, then terminal connect again within 60s and order will be opened, but if it's later than 60s the order will be ignored. Signal lot size: Ea Will Open New Order With same Signal lot size. Multiply with Signal lot size: Ea Will Open New Order and multiplied by a factor with Signal lot size. 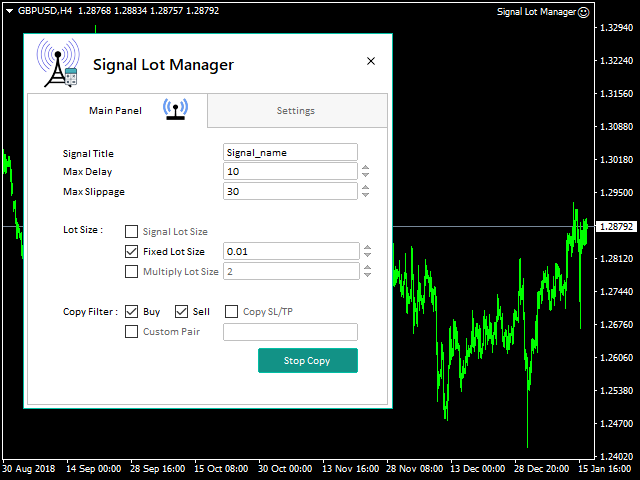 Fixed lot size: Every trades will be set with a fixed lot size regardless of Signal lot size. Copy SL/TP: Select if Stop loss and Take profit level of the orders will be copied. Custom pair: Only trade of custom pair will be copied (combine with order types above). Enter the exact name of the signal to the Signal Title parameter. The Tool didn't support the partial close yet, so if the signal close the order partially the tool will close the all order. Feel free to give your opinion about the tool .... and please inform me of any improvements needed to be done.